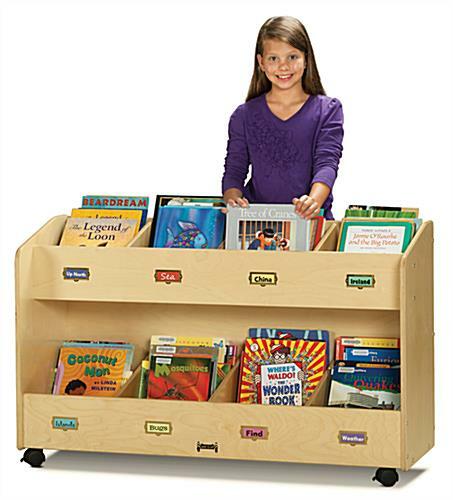 These storage carts for children are a great addition to a reading nook in a library, daycare center, or home playroom. 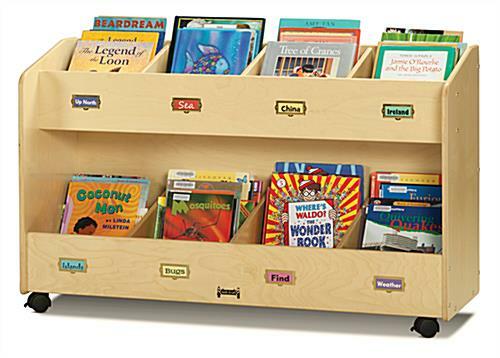 Store books, magazines, and other learning supplies in environmentally- and kid-friendly classroom furniture. This mobile rack is from our popular Jonti-Craft® - a top manufacturer of young people's furnishings. These carts for children are mounted on locking caster wheels for easy repositioning each day, depending on the roster of activities. Kid-safe and environmentally friendly, this book storage unit help create a healthy and fun environment for little tykes. 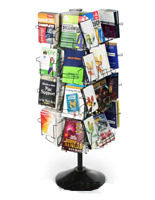 These one-sided display carts for children have eight divided areas for books and supplies. Customizable label holders enable alphabetizing by subject matter, reading level, and more. Make it easy for kids to identify shared learning resources and learn basic organizational skills. The best thing about this classroom furniture? It's GREENGUARD Gold certified, CARB II & CPSIA compliant and comes with a protective UV-treated coating to prevent sunlight damage and general wear and tear. 48.0" x 29.5" x 16.0"